Purple was the color our Bride chose for the perimeter lighting but we ran into a problem after a pretty bad rain storm blew into the area and we discovered the tent sides had not been pegged down. Lost one fixture to the rain but managed to secure things and kept moving. In the center of the tent, they did a great job with some sheer drapery work. We sprayed it with the Blisslights and it was sheer enough to punch through to the ceiling for an ultra-cool effect that everyone loved. And yes, the song selected was "Big Green Tractor". It was an outstanding and very interesting entrance. Towards the end of dinner, after looking over the crowd, we decided to pull out "The Shoe Game". 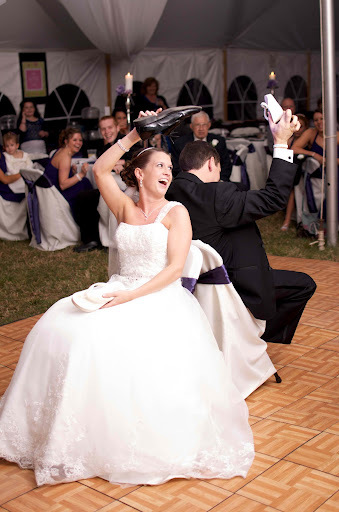 If you haven't seen it, the Bride & Groom sit back-to-back and exchange one shoe each. We ask a series of questions such as "Who controls the remote?" and they answer by holding up the shoe of the person they think it pertains to most. This was great fun and worked perfectly. Once we got into the dance set, the rest of the night was a blur and our guests thoroughly enjoyed themselves the entire evening. I have to say, Jeremy & Megan were an absolute delight to work with. They both have such a loving and gentle spirit about them and we wish them all the best. Thank you for allowing us to be a part of your special day.